This past offseason saw the New York Rangers have a lot of roster turnover, culminating in changes both on the ice and in the locker room. The two biggest names leaving the Rangers were Derek Stepan and Dan Girardi, who were traded and bought out, respectively. Those moves not only opened up spots in the lineup but indicated a fundamental change in the team’s hierarchy – both Girardi and Stepan were alternate captains and had been for years. They were also two of the longest-tenured Rangers on the roster. The Rangers front office was clearly ready for a change. The Rangers went in a more youthful direction in the offseason, with Mika Zibanejad, Kevin Hayes, J.T. Miller and sophomore Pavel Buchnevich getting more and more on-ice responsibility. Rookie Filip Chytil has been 18 for a little over a month and is the fourth line center (for now). Brady Skjei and Anthony DeAngelo will be important members of the new blueline. While the youth movement is great for retooling towards another Stanley Cup run, it left the Rangers with a team need in the leadership position. 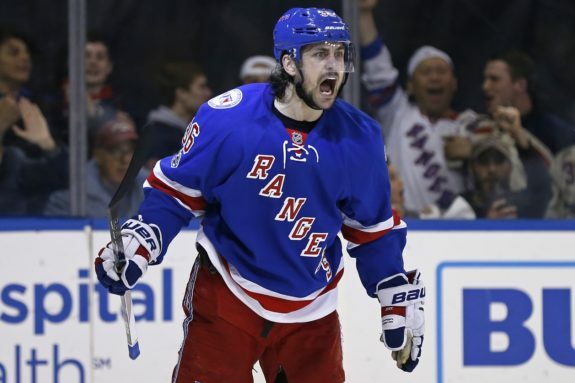 The honor of alternate captain went to their now-longest tenured forward on the roster: Mats Zuccarello. The biggest beneficiaries of the Rangers youth movement this offseason have been the forward group. There are only three forwards who are older than 30 years of age: Zuccarello, Rick Nash, and first-year Ranger David Desharnais. Seven of the 12 forwards are 26 or younger. While many of these players have multiple seasons under their belt, they are still young in the relative sense. 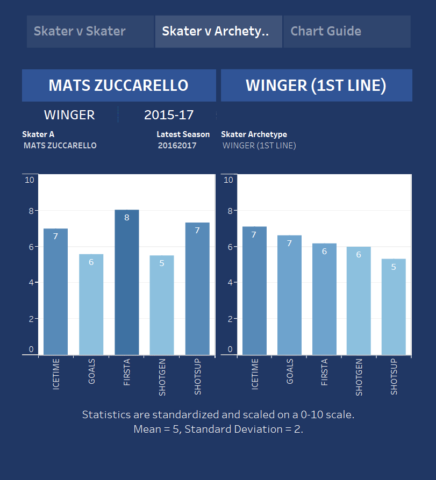 Mats Zuccarello fits perfectly into a leadership position for this group. His 385 regular season games are 67th most in franchise history, and are fourth-most on the team behind Henrik Lundqvist, Marc Staal, and Ryan McDonagh. Overnight, Zuccarello became one of the elder statesmen in the locker room. However, experience is not the only thing that qualifies someone to be a locker room leader (in my opinion) – he has to back it up on the ice, too. Zuccarello does that in spades. He is an excellent shot suppressor, and is a very unselfish player, as his assist numbers suggest. In his 385 games for the Rangers, Zuccarello has put up 87 goals and 180 assists, giving him 267 points. His assist total is 43rd-most in franchise history, and his point total is 48th-best. He has certainly made his mark on the franchise and is easily one of the more memorable Rangers of the past decade. Mats Zuccarello is the first #NYR who has tallied five points in the first two games of a season since Bernie Nicholls in 1990-91. Zuccarello’s play has been exemplary for years — he has been a key cog in the Rangers deep Stanley Cup playoff runs, and, without him, they would be a much worse team. That alone should have made him the obvious choice for an alternate captain role after the Rangers parted ways with Stepan and Girardi.